THE WRITING BUDDHA - Opinions | Books | Movies: The Bestseller She Wrote by Ravi Subramanian (Book Review: 4*/5) !!! 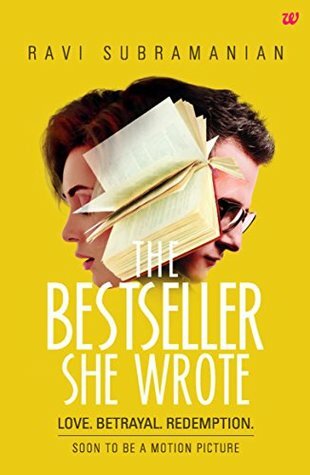 The Bestseller She Wrote by Ravi Subramanian (Book Review: 4*/5) !!! There can be nothing better than spending your weekend with a book. But when it's a book by one of your favorite authors, it becomes more special. I read Ravi Subramanian's latest book "The Bestseller She Wrote". This is his 4th book that I have read though he has 8 books under his name. I was really excited for this release as it was related with the literary world of India which I have been following very closely from last 6 years. And when it's written by Ravi Subramanian, you know that he is going to talk about some realities under the name of fiction which will make you feel connected with the characters and the story. And it happened ditto. The cover of the book is very unique and beautiful and it is great to know that the book is also under the process adapting it into a movie. TBSW is a story about how a girl who aspires to be a writer meets India's most famous author. They meeting becomes a regularity and the married author starts falling for this young girl. But she is more concerned about her book to get published and turned into a bestseller with the help of this author who has himself written 4 bestsellers back to back each breaking record of the previous one. This is the basic plot which leads to many scenarios and leads to several twists and turns and finally in the climax, like every book of Ravi Subramanian, you are left alone for shocks and surprises. Ravi Subramanian is an amazing thriller writer and his books start doing magic right from the first page itself. Talking about this particular book, I felt as if Ravi chose an easy way to tell his story with an intention of making it a light read for another mass of audience which do not read the genre he writes. For the whole first half, it felt as if someone else is writing it for Ravi S. Though in between of some chapters, author have kept dropping hints of something being wrong with the doings of few characters but it still does not give you any thrill until the second half begins when his marriage starts getting affected because of his extra-marital exploration. Ravi Subramanian have integrated his story very well with many real-life incidents of famous Indian authors which keeps you interested if you have been in touch with the literary world lately. You start relating with the characters very soon and see your own favorite author in the lead character and you even start imagining other not-so-famous authors in the character of Shreya. The whole process of how a person writes a manuscript till how the book launches in a big event, everything is perfectly described by Ravi. And the way story unfolds in the end, it makes you happy that you have finally witnessed the excellence of Ravi Subramanian once again. The most unexpected person turns out to be the ill-wisher of everyone.